The Bulova Willits Mantel Clock is from the Frank Lloyd Wright Collection™. 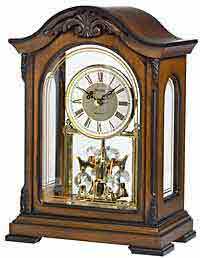 It has a craftsman style solid wood case with a walnut finish with a multi-stepped base. The wood swinging pendulum is rectangular in shape to match the floating white rectangular face. The face features a single black square at the 12 o'clock and 6 o'clock positions as well as the orange Frank Lloyd Wright collection logo. The protective glass is a representation of the decorative glass windows in the living room of the Ward W. Willits House in Highland Park, Illinois. This clock is inspired by the Willits home is like the one on display at The Art Institute of Chicago. The back panel is clear plastic to allow light to shine through the clock. This clock has an accurate Non-Chiming Quartz, battery operated movement that requires 1 AA Battery. Size: Height 15", Width 7", Depth 3.5". Clocks for sale at The Clock Depot including the B1839 at discount prices.